Further information on the exhibition can be found on the website of the Museum für Fotografie, some impressions can be seen at ullsteinbild.de. "The Photographer in Love - the Rediscovery of Karl Schenker" already in 2014 at the Galerie Lardon in Ahrenshoop. Now ullstein bild collection is one of the main lenders for the exhibition "Master of Beauty. Karl Schenker's sophisticated worlds of images" at Museum Ludwig in Cologne 2017. Here you can see 36 works by Schenker von ullstein bild, 34 of them in the original. The extensive and qualitatively outstanding Karl Schenker collection at ullstein bild includes over 400 original photographs. Karl Schenker (1886-1954) is without question one of the most fascinating photographers of the first half of the 20th century. The native Austrian spent the time of his artistic education and work as a drawing teacher in Warsaw. Around 1913 he came to Berlin and became one of the city's most successful portrait photographers. Nevertheless, in 1925 he handed over his studio to the photographer Mario von Bucovich (1887-1947), lived and worked in New York for five years and then returned to Berlin. Six years later he left Germany again, emigrated to London and died here in August 1954. In the early 1920s, his works were frequently published in the renowned magazines of the Ullstein publishing house, such as "Die Dame", "Uhu" and "Querschnitt". At the same time, the twenties were a time of intensive studio work for him, and he produced a variety of portrait studies of well-known and prominent actors, dancers, sportsmen, musicians and artistic directors. Other motifs show the expression of another artistic style: wax figures. Schenker designs and models life-size, extremely elegant mannequins à la mode, photographs them, and places them in a striking way in his portrait studies. The effect of these photographs has not least prompted the American artist Cindy Sherman to show Karl Schenker's wax figure paintings in the 2013 exhibition she curated for the 55th Venice Art Biennale. On the occasion of the 25th anniversary of the Day of German reunification, a reception with around 800 invited guests will take place at the German Embassy in Bern on 7 October 2015. On the same day and as part of this celebration, our exhibition "World City Berlin around 1900 - Photographs from the HAECKEL Collection" will be opened. For a good reason: For several years now, the capital Berlin has been developing seemingly unchecked into an extremely versatile, inspiring and courted city. A look into the past and at the beginning of the 20th century shows a comparable potential, of course under completely different conditions. Forms of government, educational systems, social standards, economy and markets, culture and technology, everything has changed, and yet looking back enriches our knowledge of the ruptures, the changes, the progress, loss and, last but not least, our view of the present time. At the same time as the reception of the Embassy for the Day of German Unity 2015, HAECKEL's photographs present the guests of the Residenz with the facets of a pulsating metropolis Berlin of the 1910s and 1920s, with relevant pictorial themes of that time. A total of 22 exhibits show motifs on people's everyday lives, city architecture, economy, politics, technical innovations, art and culture. They show the view over the sea of houses from the spire of the Red Rathau at Alexanderplatz, the Potsdamer Platz traffic junction, the first ascent of the Zeppelin "Suchard" in Johannisthal, the meeting of the two artists Adolph von Menzel and Anton von Werner, the rush to the platform barrier at the Stettiner station or horse-drawn sleighs on the frozen Wannsee. Until 30 November 2015, our exhibition will be shown alongside numerous events and receptions taking place in the Embassy's residence. Visitors to various high-ranking events, such as the "Ber(li)ner Salon" discussion series, will be able to see early press photography with pictorial themes such as..: Balloon competition in Schmargendorf, the suspension railway test track in Brunnenstraße, cycling races in the Olympic Park or kite flying on the Tempelhofer Feld, bathers in the Wannsee lido, Japanese visitors to Berlin on the Schlossbrücke, the writer Georg Hermann, strawberry harvest in the Laubenkolonie or pancake baking at Aschinger. In addition, the date on which these photographs were taken coincides with the time of construction of the Berne Residence, in whose spacious and inviting rooms the pictures are shown. Following our exhibition "Weltstadt Berlin um 1900 - Fotografien aus der Sammlung HAECKEL" in the Residenz in Bern, all exhibits will be on display in the new legal and consular building of the German Embassy directly opposite the Residenz until the end of 2015. This new building, designed by Sven Stucki Architekten Bern in 2014/2015, is a modern exhibition venue and offers at least as suitable a setting for Haeckel's photographs. While our exhibition was hung in the Residenz on German Unity Day, it will celebrate its premiere here in the embassy's consular building. And it proves the successful combination of first-class black-and-white press photography and modern architecture. In Werderaner Frühling everything seems possible: brotherhood, exuberance, natural bliss, pleasure, sheer cheerfulness. The one or other drop of fruit wine may benefit the adults to the blossoming of the trees in Havelland, but also the children are inspired by the uplifting effect of the spring air and the move out of the city into the winter-free nature. The only ones who seem to slow down this movement are the musicians on this Haeckel photo from Werder: The Bacigalupo barrel organs take the steep path up to Bismarckhöhe on the back. From a distance, this motif recalls a copper engraving by William Hogarth, on it two schoolboys with their bags, to whom Georg Christoph Lichtenberg remarked unerringly that they went to school as if with snail shells and in a spiral walk, temporary standstill not excluded. Now there is certainly reason enough to rush the school course, to fail all hasty purposefulness and even to slow down the speed intended for it. Haeckel's musicians also speak of this retarding moment, they slow down the action of the photo from Werder, and they slow down our gaze. Everyone around them may nimble, determined, light-footed approach their goal - they may not. It becomes clear that this event also has different ways of playing. Tree blossom festival, tree blossom festival, these barrel organ players in Haeckel's photo from Werder set off in the hope of a reward that will only be meagre. Their hardship and the hardship of the way combine with the photographer's point of view - and in a single picture. You can find more photos from Berlin and the surrounding area in the Haeckel Galerie Berlin, an overview of all Haeckel portfolios on our website can be found in the gallery overview. At the time of taking this Haeckel portrait photograph in front of the big city backdrop of Berlin in about 1911, Georg Hermann - actually Georg Hermann Borchardt - was one of the most sought-after writers of his time. He has published several novels, writes for the newspapers and magazines of the extremely successful Ullstein publishing house in Berlin, which has shaped the media world, and is the first chairman of the Association of German Writers, which he co-founded. The Haeckel photography is part of a unique series of pictures, all taken on a sports field in Berlin. Well-made, experimental portraits, for which the photographer and the writer agree on a light-filled summer day in Berlin. Only a few years later another photographer, Waldemar Titzenthaler, portrays the writer Georg Hermann in his Berlin apartment. This photograph can also be found in the ullstein bild collection. Here, too, the focus is on the person of the writer and his private environment, and it is similarly true that it is not a shrill "home story," but a concept of the photographer that determines the shot. The domestic environment and the family members portrayed here invite the viewer to explore the panorama of the interior architecture and the artistic richness of things: Space, furnishings, furniture, paintings, collectibles. 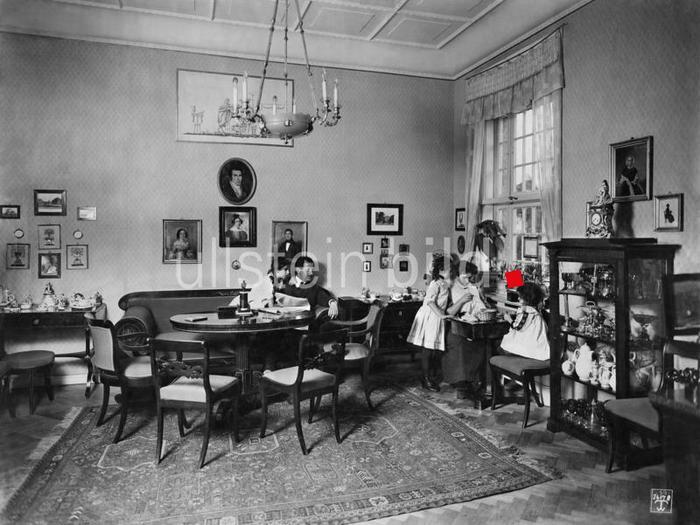 The photographs from Titzenthal speak of bourgeois living culture, of Georg Hermann's sense of family, of his pronounced preference for Biedermeier furniture and of his passion for collecting. On the sports field we now meet Haeckel, the tennis enthusiast, who also expresses his joie de vivre and bourgeois design of his life here. Georg Hermann not only enjoys a good social reputation, he has also found a breeding ground for his artistic work. Georg Hermann's novels, in which the narrative art of Theodor Fontane or Wilhelm Raabe can be traced, were among the great public successes of the 1910s and 1920s. His works, such as "Henriette Jacoby" or "Heinrich Schön jun. ", are characterized by a great narrative intensity, with colouring, impressions of nature, lighting and the mood of the narrative figures constantly intensifying. In 1933, National Socialist rule forced the Jewish writer to flee the artists' colony in Berlin Wilmersdorf. He lived in Amsterdam for the next ten years. In November 1943 Georg Hermann was first taken to an internment camp in Westerbork, then to the concentration camp in Auschwitz Birkenau, where he was murdered. Haeckel Photos of other personalities and celebrities can be found in the Webshop, historical Berlin pictures in the Haeckel Gallery Berlin. The gallery overview provides an overview of all Haeckel portfolios on our website. The view into Berlin's Friedrichstrasse on the Haeckel photos opens up a constantly remarkable panorama of the city's architecture. For both the events captured in the picture and the daily routine suggest that who or what pulsates here is also gaining in importance against this backdrop. Even if only for the moment when the instinctive press photographer takes the picture. The illustrated book "Berlin - Portrait of a City" from Taschen Verlag takes up such a Haeckel photograph of Friedrichstrasse, to be found on page 39 of this Coffee Table publication, in the somewhat handier paperback edition on the double page. Haeckel is in association with photographers such as Friedrich Seidenstücker, Willy Römer and Heinrich Zille, whose Berlin motifs and Haeckel's photographs are among the most convincing portraits of this imperial city. For if you want to name a city to which the Haeckel brothers have dedicated their work, then it is Berlin: here they live and work, set up their company, their press photo agency, wander through the streets and squares, follow the events and happenings. This kind of rootedness goes far beyond the purely thematic focus of Berlin. The Berlin motifs under the Haeckel photos in particular suggest that the two photographers have an eminent knowledge of this up-and-coming city and an equally keen eye for people and places. More Haeckel photos of Berlin can be found in the Haeckel Gallery Berlin. The First World War left deep marks on the civilian population of Berlin as well, because there is a shortage of food. This is what our Haeckel photo speaks of, which in the Spiegel issue of Geschichte "Der Erste Weltkrieg" (No. 5 / 2013) on a double page makes the topic unmistakably present: Women and children search for usable fruit among the pumpkins damaged during transport. The food supply in World War I is one of the major themes of these years and is therefore also expressed in the Haeckel photos in a variety of motifs: they show women in an army cannery preparing food, filling the cans and preparing them for transport. Elsewhere, members of the German-Evangelical Women's Federation provide the children of the Landwehr men who went to war with meals. And since the two Haeckel brothers work as war photographers, the majority of the Haeckel photos describe the food supply in World War I at the front: field kitchens, field bakeries, food transports to the front, a "people's kitchen" in Russia, soldiers and prisoners of war at the food counter, where hunger and cold, suffering and trouble are written all over their faces. Haeckel photos of the 1st World War can be found on this page, more pictures from Germany in the Haeckel Germany portfolio. The gallery overview provides an overview of all Haeckel portfolios on our website. We stand face to face with this castle in Poland, in the middle of the First World War. The doors and shutters are locked, no one, no inhabitant seems to be present in this castle in Poland. Only in the half reliefs is there a movement to be found, a multi-figured ribbon adorns the building. The roof sculptures above the balustrade look down on the viewer unmoved. The house in Wilanów seems abandoned, silenced, and with it a place steeped in history has become silenced, where Polish history continues. Here, in this Haeckel photography, past and present meet hard. Triumphal claim to power and glorifying warlike conflict in the architecture of the Baroque age - oppressive abandonment at the time of photography, at the time of a world war. The soldiers of the German Wehrmacht probably already marched into nearby Warsaw. A series of photographs from the Haeckel Collection describes the entry of the units of the 9th Army under their commander Prince Leopold of Bavaria on August 9, 1915. A few days earlier the Russian troops had vacated the city without a fight. This marks the beginning of the period of German-Austrian occupation, and Warsaw will be the capital of the Generalgouvernement until the end of World War I in 1918. A photographer moves away from the war, finds himself beyond all sabre-rattling in an unbelievably magnificent, three-winged castle complex and uses the opportunity to capture this encounter. Where exactly and whom is he facing here? Palais Wilanów, the castle in Poland, is a work of the Baroque period, founded as a royal residence by Jan III Sobieski, and at the same time a meaningful, impressive testimony to Polish architectural history. Between 1677 and 1779, the central wing of the palace was built, and King Sobieski commissioned his court architect and confidant Augustyn Wincenty Locci, a Polish architect of Italian descent, to build it. At this time, the small village of Milanów (today's Warsaw district of Wilanów) experienced a rapid rise to "Villa Nuova / Nova". Wilanów thus concludes the traditional Warsaw Royal Route in the south. And Sobieski provides a refuge that symbolizes his claim to power, not only as a heroic victor of many battles and as king of Poland and Grand Duke of Lithuania, but also as a widely travelled and educated ruler. Over the following decades Wilanów underwent many expansions and changes. For three years, from 1730 to 1733, Augustus the Strong resided in this castle in Poland as the direct successor of Sobieski and Elector of Saxony. Later, various families of the Polish aristocracy lived in the estate, most recently Potocki and Branicki. Both the architecture and the garden of this palace in Poland have undergone a stylistically formative expansion over the centuries. The result is a highly representative ensemble of many artistically rich Italian, French and English influences - an expression of Polish history. Haeckel photos from World War I can be found on this page, more pictures from European countries in the Haeckel Europe portfolio. Otto Haeckel was, as so often, in the right place at the right time. Our photo of the protest in Berlin Friedrichshain from 1910 is published half page by the Berliner Illustrirte Zeitung from the Ullstein publishing house and celebrates the peaceful rally in Berlin under the open sky with police permission as the "beginning of a new era of political struggle" and "a time of open-air politics". An estimated 200,000 people have responded to the call of various democratic parties to push the reform of the three-class electoral law. A society of hat wearers voting on this rally: If you want to get ahead - get a hat? At least the crowd demonstrates great unity in the choice of headgear, no cylinders, no Panama hats and certainly no military caps determine the picture, but bowler hats. Certainly due to the adequate clothing on this Sunday in April, but also an indication of the togetherness and common interests of the gathered. The majority of the protesters in Berlin were not representatives of the aristocracy or the military, but rather the reformers of the "national-liberal and liberal parties", as another Haeckel text on the 1910 Berlin electoral protest assemblies says. The reform bill presented by Reich Chancellor Theobald von Bethmann-Hollweg in the same year to change Prussian electoral law was rejected by the Reichstag. More Haeckel pictures from Berlin can be found on this page. The gallery overview provides an overview of all Haeckel portfolios on our website. August 1913 at the airfield of Berlin Johannisthal: The view into the well-visited grandstand restaurant, to which Haeckel helps us with this photograph, gives us an idea of the hustle and bustle at this place. Hardly any space is still available, the waiter a sought-after man, and the elongated room at least in the front part full of summer light. Warm air penetrates through the open windows, a perfect day out. Even the press photographer Haeckel, often in a hurry and on the move, has taken his time - because none of the guests gives him even a spark of attention. How long did the unmissable camera stand on the landing of the stairs to be not only tolerated but also ignored as a self-evident part of the interior design? How long did Haeckel wait for his actors to do what they are supposed to do: ignore him, devote themselves to their activities, turn to each other, knowingly stand out from the crowd, observe and be observed, all this and more, why people go to a restaurant and get together there. Beyond food intake. At some point the goal is reached, the photographer is invisible, as if someone had thrown a magic cap over him. He is no longer part of this society, but its portraitist, and it is only now that he chooses the moment - angle and perspective have long been fixed - that corresponds to his imagination, his idea of this picture. 100 years later, again in August. The photograph is published in the magazine "Stern". Double-sided. Colored for safety's sake. And here it becomes comprehensible how completely coherent, how successful and how magnificent the photograph is, because it was not least made for this kind of performance. Further Haeckel pictures from Germany can be found in the Haeckel Gallery Germany , an overview of all Haeckel portfolios on our website can be found in the Gallery Overview. One of the numerous Haeckel pictures from China shows eight musicians with their instruments in Guangdong. Music and musicians are among the most grateful picture themes of the Haeckel collection at ullstein bild, here it sounds from all corners of the world and - not least when looking at Haeckel's pictures of Asia - in the most enchanting garments or out of pure necessity, on water or land, military or civilian. Now eight musicians in China have aroused the justified interest of a musicologist. Because the original, somewhat sparse text to one of the most remarkable Haeckel pictures from China definitely leaves something to be desired. And our own knowledge would at best have been sufficient for the famous three Chinese with the double bass, who are certainly not the subject of this picture from Guangdong. So what could be more natural than to ask an expert about Haeckel's pictures from China? Cultural context / function: The ensemble depicted shows a combination of instruments that can be assigned to the second of the two Chinese categories sizhu (literally "silk and bamboo", i.e. chamber ensembles dominated by stringed and softer wind instruments) and chuida (literally "hitting and blowing", i.e. outdoor ensembles dominated by drums, idiophones and loud wind instruments). Similarly composed ensembles are still in use today at funerals and - at least in Taiwan - in religious processions in the context of Daoist temples and rituals. Further Haeckel pictures from China can be found in the Asia Gallery, an overview of all Haeckel portfolios on our website can be found in the Gallery Overview.